Bellfield Brewery: where are they now? Gluten-free brewer Bellfield Brewery raised over £170,000 in April 2015 with the support of 166 investors. They recently received a new cash injection of £430k so we caught up with them to see how the company has progressed since their campaign, and what their plans are for the future of gluten-free brewing. For those who don’t know, could you tell us about Bellfield Brewery? 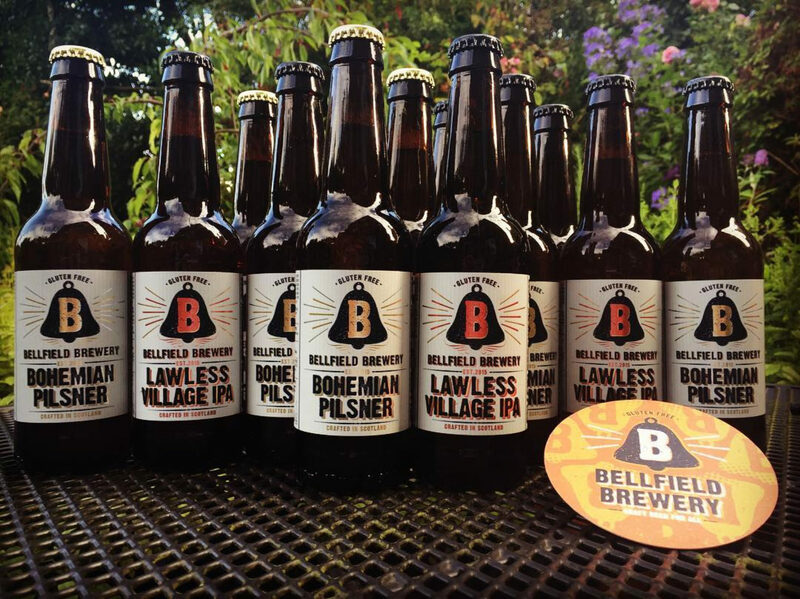 Bellfield is the UK's first dedicated gluten-free brewery. We brew contemporary interpretations of classic styles, using the simplest ingredients: carefully selected grains, hops and pure Scottish water. All Bellfield beers are Coeliac UK accredited and carry the ‘crossed grain’ symbol. Since we started producing our first beers in early 2016 we have created a network of wholesalers, retailers, and independent traders across the UK. We have been particularly successful with the food service sector as our beers are light and tasty, complementing all kinds of food. We’ve recently secured listings with Scottish branches of several multiple retailers, established some healthy export partnerships and are experiencing strong demand for our products. We have geared the company to be able to grow quickly, and our ambition is to become the brand leader in our space. Bellfield’s mission is to produce Craft Beer for All - great tasting beer that happens to be gluten-free, and we are starting to receive some independent recognition that we are getting there. Our beers have already won several prestigious awards: Lawless Village IPA was UK winner (gluten-free category) in August’s World Beer Awards. The Bohemian Pilsner won Silver in the same category. Earlier this year the Pilsner won Gold in the UK Free From Food Awards; the IPA won Bronze. Bellfield’s Pilsner came 2nd in the Independent’s recent Top 10 Gluten free beers list. The IPA is a finalist in the best IPA category of the 2017 Scottish Beer Awards, definitely making it a Craft Beer for All, whether gluten intolerant, coeliac or someone who just wants a great tasting IPA. Where did you get the idea to create a gluten free brewery? We first had the idea nearly three years ago. Two of us are Coeliac, and at that time there were very few good gluten-free beers on the market. Having been recently diagnosed, my husband was ‘in mourning’ for good beer – hence the strapline on our bottles’ “Born of Grief, Brewed with Love”. We felt coeliacs were being left behind by the craft beer revolution, and so we wanted to make great beers that everyone could drink. Do you think the greater public awareness of gluten intolerance has helped to raise the profile of Bellfield Brewery? It’s important to differentiate between Coeliac disease (a life-long, auto-immune disease) and people who are intolerant or prefer to avoid gluten because they feel better for it. There is certainly a lot more awareness, especially in the food sector. Since we launched, a large number of ‘big’ breweries have launched gluten-free versions of their beers, which they produce by de-glutenising, using enzymes. We prefer to make our beers gluten-free naturally, without the addition of any chemicals. What has the investment you received in your Crowdcube funding round from April 2015 helped you achieve to date? It helped us launch our beers into the market in March 2016, to have four part-time employees, and to invest in our branding, marketing and establish strong distribution partnerships. Without the Crowdcube funding, we would never have got to where we are so quickly. You’ve just raised another £430k of funding, what will this be used for? The new funding will allow our existing team to commit full-time; will allow us to strengthen our business development team, invest in developing more export opportunities; invest in our marketing and point of sale materials – and finally, allow us to complete the fit out of our premises in Edinburgh. How is your business performing against your projections in 2015 - have you hit any challenges along the way or changed direction? As we completed the crowdfunding process it became clear that a number of larger competitors were looking to launch gluten-free beers. We therefore decided to press home our first mover advantage and get our beers and our brand into the market as quickly as possible. Establishing rock solid logistics and fulfilment was also a key challenge. We’ve put a great deal of effort into our back office systems; we have really good Cloud based CRM, invoicing and inventory management systems. We have also established excellent distribution and logistics infrastructure across Scotland, the UK and internationally, and we’ve secured contracts with some of the UK’s leading wholesalers and Food Service companies. Some things have taken longer than we anticipated when we produced our initial plan – especially securing supermarket contracts and getting our beers listed with some of the really big players in the Food Service industry; they just move a lot more slowly than we’d anticipated and review their ranges only once or twice a year. Other than the financial backing, have there been any additional benefits of being backed by a crowd of investors? It’s wonderful having 168 brand ambassadors, especially when we’re trying to get people to amplify our social media reach or nominate us for awards, and for building word of mouth to get listings such as Naked Wines. It’s also great to get feedback from them and to feel that connection with people who have a real interest in how the business is doing. A number of original investors also supported the recent raise. We are sure that many coeliacs are grateful to Bellfield for providing them great gluten free beer to drink. What has been your best piece of feedback on your products? Hard to say, but probably the feedback we’ve had from non-coeliacs, who like our beer because it tastes great and didn’t even realise it was gluten-free. A number of pubs in Edinburgh now sell our beer on tap - selling many kegs a week - they just tell people it’s a great tasting local beer! Finally, what are your plans for the future of Bellfield Brewery? Simply to be the number one gluten-free beer brand in the world! To follow Bellfield Brewery's progress or get in touch with the team to find out more, you can check out their website here.